The replacement flight led by Lieutenant Commander G. Rohrsheim arrived at Blackhorse on September 9, 1968 and Lieutenant Commander Rohrsheim relieved Lieutenant Commander Ralph as the executive officer of 135th Assault Helicopter Company. Lieutenant I. M. Speedy was the senior pilot, second-in-charge of the Flight, and commander of the 1st platoon for the first six months of his tour, before being relieved by Sub-Lieutenant C. R. Rex. For the remainder of his tour, Lieutenant Speedy carried out the duties of operations officer. Enemy activity in III Corps in this period was most marked in Tay Ninh province north-west of Saigon. The company continued to fly in support of the 5th and 25th ARVN Divisions, the ARVN Airborne Brigade, elements of the US 9th and 25th Infantry Divisions and the 1st Australian Task Force. Contact with the enemy remained light until October 23, when 9th Infantry Division units met heavy resistance south-east of Ben Tre, Kien Hoa province. The EMUs led by Lieutenant Commander Rohrsheim made seven landings in three landing zones. Two aircraft were shot down and seven damaged with four crew members being injured. A helicopter piloted by Sub-Lieutenant T. F. Supple was one of those forced down by enemy fire. He and his crew were rescued by an aircraft piloted by Sub-Lieutenant A. J. Huelin. The 135th was re-allocated to the 222nd Combat Aviation Battalion in mid-November and on November 23 moved to Camp Martin Cox (Bearcat), twenty miles north-east of Saigon in Bien Hoa province, to be with the other companies of the 222nd. This change of parent battalion occurred frequently during the four-year RANHFV/ 135th AHC integration—a disruptive event, as the battalion HQ was responsible not only for the control of company personnel (postings, replacements and leave), but also was responsible for the provision of building materials and recreational facilities. The move to Bearcat added support for Thai Forces to the operational commitments of the EMUs, as at that time the camp was the main base of the Royal Thai Army in Vietnam. The Bearcat-Long Binh road was mined twice in early January. On the second occasion, the truck used to transport local Vietnamese to and from their day’s work at the camp was extensively damaged. On January 28, a small enemy group was engaged on the perimeter while firing mortar rounds into the camp. Intensive mortar attacks resumed in late February with ninety-nine rounds landing in or around the company area in a six-day period. No personnel were injured although some minor damage was done to buildings. On January 3, 1969, Sub-Lieutenant Huelin, his US Army co-pilot and aircrew were killed when their helicopter hit power lines near Saigon, crashed and exploded. They had been detailed to fly from Bearcat to the Seven Mountains area, Chau Doc province, a distance of about 140 miles. Low cloud and fog conditions were prevailing at the time, but because the mission was an important one, Sub-Lieutenant Huelin was unwilling to abandon it. He took off on the long flight early in the morning and, remaining dogged by thick cloud, hit the powerlines just before dawn. His determination to carry out a vital mission in the face of adverse weather conditions was a striking indication of the high morale which sustained RANHFV. The dry season campaign of the 7th and 9th ARVN Divisions in IV Corps had begun on December 8, 1968. The 135th was under the control of the 214th Aviation Battalion for these successful field operations in which eighty-nine Viet Cong had been killed by the end of the year. This new commitment to operations in IV Corps necessitated long flying hours as the 7th and 9th ARVN Divisions were in action in the Delta from My Tho, a provincial city thirty-five miles south of Saigon, across to Long Xuyen, nearly 100 miles from Saigon. Operations in IV Corps had always been a possibility for the EMUs, but after one large operation in the Ca Mau peninsula in early December 1967, the 135th had made few flights into the corps area. The campaign to clear the northern IV Corps provinces of enemy forces continued through January and February 1969 with the EMUs engaged almost entirely in the provinces of Sa Dec, Vinh Long and Vinh Binh, assisting the 9th ARVN Division. The early evening of February 2 found the EMUs taking part in a vigorous action in Vinh Long province. The slicks were held down in the landing zone by heavy fire from a Viet Cong force entrenched in a treeline. Some of the gun-ships called in to assist in extricating the slicks were themselves hit and forced down. Sub-Lieutenant Supple and Sub-Lieutenant W. E. Symons, with their crew, escaped from their downed helicopter only by conducting a running gunfight with the Viet Cong, having unhitched the M60 machine-guns from their aircraft. They were rescued by Sub-Lieutenant M. A. Perrott and Sub-Lieutenant R. J. Kyle who, having been recalled from Ben Tre, had to pilot their slick through intense ground fire to reach the downed aircrew. Sub-Lieutenant Symons was wounded in action during night operations on February 22 and after surgery at the 1st Australian Field Hospital returned to Australia in March. He was replaced in the contingent by Lieutenant A. H. Craig from 9 Squadron RAAF. In 2979 flying hours during February, EMU aircraft received forty-eight hits, and the company killed fifty-two Viet Cong. As the dry season campaign progressed in March and April, the enemy scored fewer hits on EMU aircraft while continuing to suffer high losses themselves; by early April the 135th’s aggressive airmobile tactics had broken enemy regiments and battalions into companies or smaller units. Depressed Viet Cong morale was shown by the marked increase of Chieu Hoi rallying to the Saigon government. EMU helicopters received twenty-seven hits in March and killed more than eighty Viet Cong. In April fifty-six Viet Cong were killed with the enemy scoring only three hits on the company aircraft. As Viet Cong units became smaller, ‘Eagle flight’ tactics were widely used. A single gunship, or small flight, directed by the ground commander who took advantage of freshly-acquired intelligence, quickly searched an area for caches and enemy locations. On April 18, an EMU aircraft on one of these missions engaged a Viet Cong company, preventing its escape while troops of the 7th ARVN Division closed in to capture twenty-five of the enemy. Sub-Lieutenant J. M. W. Hart was the co-pilot of this gunship which killed ten of the enemy in the exchange of fire. In mid-May, Viet Cong mortar attacks on Bearcat increased in frequency causing EMU aircraft to be evacuated to Blackhorse on a number of occasions. This necessary but inconvenient move required the helicopter crews to be prebriefed at Bearcat for the next day’s mission after a full day’s flying, given an issue of field rations and sent to Blackhorse to sleep on stretchers or in their aircraft until their departure for operations at 0500. On May 31, five miles west of Dong Tam, Dinh Tuong province, EMU slicks arriving with troops of the 11th Regiment, 7th ARVN Division, met heavy fire as they approached the landing zone. The accompanying gunships engaged the enemy force which attempted to escape to a wooded area north of the landing zone, and the lead gunship, with Leading Aircrewman N. E. Shipp as a door gunner, swung around in pursuit. To fire more effectively at the retreating Viet Cong, Shipp hung partially out of the aircraft, exposed to intense automatic weapons fire. The gunship commander was fatally wounded and the helicopter went out of control, crashed and exploded, killing all the crew. Shipp was seen to continue firing at the enemy until the moment of impact. On June 16, Naval Airman C. C. St. Clair was evacuated to Australia after being seriously wounded near Cai Be, Dinh Tuong province. He was a gunner in one of three helicopters shot down as they attempted to rescue a large number of wounded ARVN soldiers. Enemy activity in northern IV Corps increased with the onset of the ‘wet’. Especially marked were attacks on fire support bases and small outposts. The deteriorating weather caused some missions to be cancelled in June. The withdrawal of the US 9th Infantry Division, which speeded up in June and July and was completed during August, left the 7th and 9th ARVN Divisions responsible for the security of the Delta provinces. Much of the 9th Division’s equipment was given to the 7th ARVN, and the 9th’s supporting aviation units (including the 135th) were also allocated to the Vietnamese. Consequent upon the American withdrawal from the Delta was a greater use of Regional Force and Popular Force (militia) troops in the field. Operations in July concentrated on the closing of enemy supply routes from Cambodia into northern IV Corps. The major action involving RAN personnel in July was a dusk encounter with an enemy unit. Sub-Lieutenants Symons and Supple in two light fire teams killed sixteen Viet Cong, and ARVN soldiers captured another eight. Three men—all that were left of the Viet Cong unit—surrendered to an ARVN outpost the next morning. Eleven EMU aircraft were damaged by enemy fire during the month with four US Army aircrew being killed. The first group of RANHFV ’69 arrived on September 10, 1969 under the command of Lieutenant Commander D. D. Farthing who relieved Lieutenant Commander Rohrsheim on the 16th. An observer, Lieutenant P. J. Arthur, who later became company operations officer, was second-in-command of RANHFV ’69, while Lieutenant R. Giffen was the senior pilot. The second group of RANHFV ’69 arrived on October 8. The typical combat group provided by the EMUs at this time consisted of one UH1H command and control helicopter, three UH1C gun-ships, and eight UH1H slicks. Two further slicks were provided as direct combat support aircraft (‘swing ships’) which operated independently on reconnaissance and courier missions and could give general support to ARVN regimental commanders. On September 23, a Viet Cong was wounded and captured in Sa Dec province by the crew of a gunship piloted by Lieutenant Giffen and Sub-Lieutenant Symons, while on the next day members of RANHFV ’69 first came under fire when seven slicks were hit in a combat assault in Kien Hoa province. Though many rounds pierced the helicopter cabin areas, the aircrews and embarked ARVN troops remained unscathed. In October, enemy activity in IV Corps was generally moderate, but increased infiltration of men and material through the Plain of Reeds in preparation for the winter-spring campaign was observed. Sub-Lieutenant C. Mayo was the co-pilot of one of three EMU helicopters hit by enemy fire near the town of Go Cong in the province of the same name on October 30 and forced to make emergency landings. Two US Army crewmen were injured. EMU gunships were sent to the aid of a battalion of the 7th ARVN Division on November 18. In spite of substantial air support, the battalion was overrun by two Viet Cong battalions armed with rockets and 50-calibre machine guns. Fifty-five ARVN soldiers were killed with their two US Army advisers, and two EMU helicopters were seriously damaged. Sub-Lieutenant R. Marum was left ‘startled, but unhurt’ when a round pierced the windscreen of his slick and ricocheted off his flying helmet. Later a platoon leader, he was wounded near Cai Be on January 22, 1970. Problems with the supply of replacement aircrew, an increasing number of battle-damaged helicopters, and rigid enforcement of the 140-hour per month limit of pilot flying-hours, all combined to force a reduction in the EMU aircraft flying time from nine hours per day to six. The total aircraft flying hours for November were 2547, some 400 less than October’s total of 2949. Although total flying hours for November were lower, there was only a slight reduction of individual flying hours as many US Army pilots were not being replaced on completion of their tour of duty. Phase II of the winter-spring campaign began in the delta on the night of December 2 and large NVA losses occurred in Kien Tuong province in the following week. The EMUs were involved in only one major action during the month. On the 19th, they went to the assistance of a Regional Force Company at Binh Dai near the mouth of the Song My Tho (a northern branch of the Mekong) in Kien Hoa province. A large Viet Cong force had ambushed the company inflicting heavy losses. Continuous air strikes were directed onto the enemy positions, while slicks landed an ARVN battalion to block the Viet Cong line of retreat. The action continued through the day with more than fifty Viet Cong being killed, many of these by the EMUs. Co-pilot of a gunship which was hit by enemy fire near Cai Be on December 1, Sub-Lieutenant Giffen was shot through the left calf and received shrapnel wounds. He was evacuated to Australia on the 15th, being replaced by Sub-Lieutenant A. Perry. He later returned to RANHFV. Another RANHFV member, Leading Air Mechanic E. Shelley, was wounded on December 23. He was hit in the neck when the supply truck he was driving received rifle and mortar fire on the road from Vung Tau to Bearcat. Shelley was taken to the 1st Australian Field Hospital, Vung Tau and returned to duty on January 26, 1970. ‘Night hunter-killer’ tactics were introduced in January 1970 against enemy units moving along infiltration routes from Cambodia. This tactical concept required a command and control helicopter fitted with a powerful searchlight to fly at a low level and pinpoint potential targets which were then illuminated by a higher flying UH1H ‘flare-ship’. Behind the command and control aircraft flew two gunships ready to engage any Viet Cong units thus located. The dangers of this tactic were highlighted on one occasion when the lead gunship flew into a tree, wrecking the first three feet of its cabin but managing to return to Vinh Long in spite of branches embedded in the fuselage. Changes in the command of the 7th ARVN Division in January led to more aggressive field operations in Dinh Tuong, Kien Hoa and Go Cong provinces. With 7th ARVN units remaining in the field for longer periods, the EMUs were required to fly a greater number of re-supply missions, as well as spending many hours standing by at various points in the Delta as a reaction force. A Regional Force company was inserted into an area some miles east of Giong Trom, Kien Hoa province, early on January 25 and was ambushed that afternoon by a Viet Cong company. EMU gunships and US Navy Bronco aircraft killed forty-three of the enemy while the Regional Force company suffered only four casualties. Enemy activity in the delta increased markedly in late February with the 88th NVA Regiment attempting to infiltrate southwards from the Plain of Reeds. At this time, the 135th was hampered in carrying out its allocated missions by a shortage of aircraft and aircrew. On occasions, aircrew had to be seconded from other companies to enable the operational commitments of the EMUs to be met. In February, EMU operations centred around Mo Cay in western Kien Hoa province. Here, on the 17th, a helicopter commanded by Lieutenant Marum was hit by enemy fire and a crew member, Specialist 4 M. A. Jenewein USA, was fatally wounded. Later in the month, EMU gunships killed twenty-seven Viet Cong in the same area. Lieutenant D. B. Gibson was seriously injured on March 6 when he brought his slick into a landing zone east of Ben Tre which had been booby-trapped with a 105 mm artillery shell. The explosion completely destroyed the helicopter and killed two ARVN soldiers. Seriously wounded, Lieutenant Gibson was evacuated to Australia and did not return to RANHFV. Five EMU slicks were hit by enemy fire on March 25 while landing troops of the 10th Regiment, 7th ARVN Division, two miles east of Mo Cay. Sub-Lieutenant E. K. Wile successfully landed his damaged aircraft. His crew killed two Viet Cong as they fought off the encircling enemy force for thirty minutes before being lifted out and returned to a safe area. Enemy activity in IV Corps sharply increased at the end of March and in April was at its highest level since February 1969. In the company’s area of operations a Viet Cong force overran the artillery firebase ‘Schroeder’ on March 31 killing thirty soldiers of the 12th Regiment, 7th ARVN Division, and sixty civilians. Serious deterioration in the manning of the 135th, especially shortages of key maintenance personnel and senior enlisted men in the helicopters (crew chiefs) affected the availability of aircraft and reduced the total hours flown in April to 2401, the lowest figure for twelve months. The manning improved in May when enlisted men were up to 100 percent of complement, but pilots remained 20 percent below strength. During a combat assault in Kien Hoa province on April 28, a helicopter commanded by Sub-Lieutenant Mayo was hit by heavy enemy fire and the US Army crew chief wounded in the legs. Thirty Viet Cong were killed in this action. The joint United States/South Vietnamese drive across the Cambodian border to destroy enemy base areas began on May 5. EMU helicopters took part in the first phase of these operations, but without RAN personnel, as an important provision of the Australian/United States Military Working Agreement was that Australian servicemen would not take part in operations near the Cambodian border. 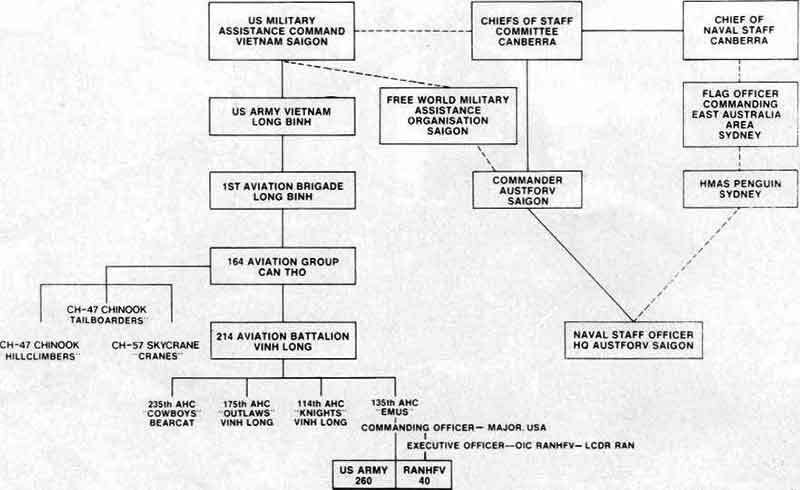 As all of the lead pilots, and all but one of the command and control pilots at this time were RAN, the enforced absence of the Australians hampered the efficiency of the 135th, and it was soon re-assigned to supporting operations in the Delta, leaving other Delta-based companies to operate in Cambodia. More than 9300 tons of enemy weapons, ammunition and food were captured or destroyed in the Cambodian operations. The captured supplies denied the enemy the weapons to equip fifty-five battalions, and the rice to give a full year’s ration to 25,000 troops. More than 11,000 enemy were killed and 2000 captured. Shortly after the Allies had declared a twenty-four hour Buddha’s birthday truce on May 18, the EMUs took part in an intensive action in Kien Hoa province. A regional force outpost in the Binh Dai district had been overrun and then heavily fortified by a Viet Cong battalion. Three battalions of the 10th Regiment, 7th ARVN Division were inserted around the outpost by slicks of the EMUs and the Dutchmasters (B Troop, 7th Battalion US Army 1st Air Cavalry, based at Vinh Long). The combined flight, with Lieutenant Commander Farthing as air mission commander, received heavy fire from small arms and machine guns throughout the six-hour long operation. The lead helicopter, piloted by Lieutenant Marum, received multiple hits and was forced to break off and return to Bearcat. Sub-Lieutenant Perry returning to Bearcat from another mission, volunteered to lead the flight for the remaining troop insertions, but a series of hits in the cockpit severely damaged his helicopter on the first night insertion. The aircraft remained in the landing zone while repairs were carried out under heavy fire and was then flown out. Sub-Lieutenant Perry led the flight for two more insertions which also met heavy ground fire. It was later found that the Viet Cong had forced local villagers to carry away the corpses of more than fifty of the enemy killed in the action. A well-entrenched Viet Cong unit hit two EMU gunships with 50-calibre machine-gun fire three miles east of Cai Be on May 19. One aircraft crashed, killing all the US Army crew. The other, flown by Sub-Lieutenant R. J. Cooper, was able to fly to firebase Schroeder. It was later written off. Three ARVN battalions were landed in the area, but it was eighteen hours before they could dislodge the enemy unit. Forty-seven soldiers of the 88th NVA Regiment which was active in Kien Phong and Dinh Tuong provinces were killed in a major engagement with units of the 7th ARVN near My Thien, Dinh Tuong onjune 7. A platoon leader, Lieutenant P. L. Clark, the air mission commander on this occasion, rescued one pilot of a US Navy OV10 Bronco aircraft shot down in action. Lieutenant Clark was again the air mission commander for a major action on the 20th, when he commanded aircraft from several helicopter companies in a day-long engagement near Ben Tre, Kien Hoa province, in which seventy-six Viet Cong were killed. On june 16, a flight of slicks led by Sub-Lieutenant Mayo was making routine troop insertions near Giong Trom when, after three uneventful landings, Viet Cong emerged from a hut and fired at the helicopters at close range. Although four aircraft were hit, only one pilot was wounded. Artillery fire, air strikes and gunship strikes killed five of the enemy. Twenty-four EMU aircraft were hit during June, the highest number damaged since September 1969. With the Cambodian operations still in progress, the 135th was required to provide most of the troop-carrying helicopters for the Delta, but this requirement lessened in July as the operations phased out, so that in that month the EMUs flew their lowest number of hours for the preceding twelve months. There were only two major actions, as the loss of safe havens and supply bases in Cambodia had significantly diminished enemy capabilities in the Delta. On July 2, Lieutenant Marum was the air mission commander in an exceptionally hazardous lift-out of a battalion of the 10th Regiment 7th ARVN Division. The flight of slicks was mortared during each of the six landings which were necessary to lift out the men of the battalion with their dead and wounded. Lieutenant Cooper, killed nineteen of the enemy. Two days later Sub-Lieutenant Cooper was credited with killing seven Viet Cong while flying in support of the 335th Assault Helicopter Company. Shortly afterwards he was forced to make an emergency landing under fire near Tra Vinh, and while still under attack he and his crew were rescued by a gunship of the 335th. During August, those NVA and Viet Cong units active in the Delta remained deployed in the same areas as in previous months. The first week of August was marked by a substantial increase in attacks, especially in Kien Giang and Chuong Tien provinces. Kien Hoa province remained as the centre of enemy activity in the EMU area of operations. September was to see little change in this situation. The highlight of EMU operations in August was a raid early in the month on a suspected Viet Cong hamlet in coastal Kien Hoa. A fifteen man SEAL team was transported to the hamlet in two slicks accompanied by a command and control aircraft and two gunships. 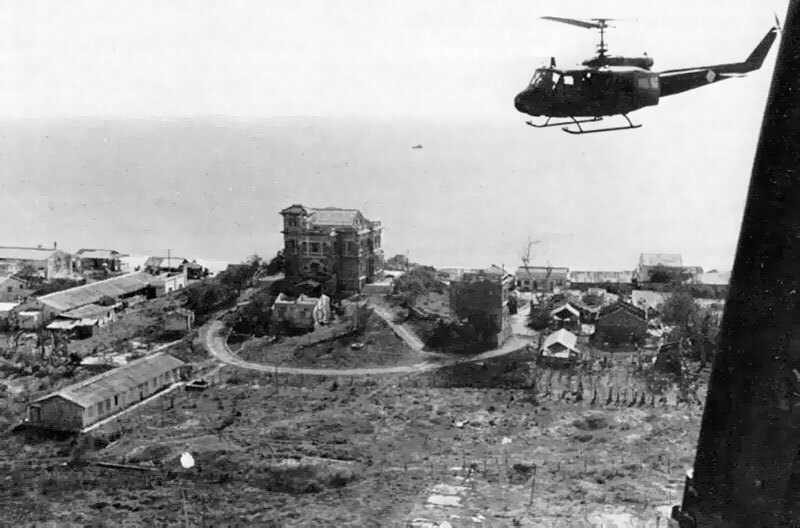 As the helicopters swept in at low level from seaward, the Viet Cong, taken completely by surprise, scattered in confusion. Twelve were killed by the fire of the gunships, while the SEALs, spending an hour in the hamlet, killed several more and took nine prisoners. The SEALs were again supported on the 25th when a Viet Cong grenade factory in Kien Hoa was located and its large stock of‘home-made’ grenades destroyed. After many delays and false starts, the 135th moved from Bearcat to Dong Tam on September 6. Operations in IV Corps had required the EMUs to make an hour-long flight from Bearcat, stopping at Dong Tam to refuel. This long flight was acceptable when the company was making only occasional forays into the southern corps, but as the EMUs had been engaged almost entirely in IV Corps operations since December 1968, a shift to a base nearer their field of action was well overdue. Dong Tam, in Dinh Tuong province about five miles west of My Tho and on the intersection of the Song My Tho and a large canal (the Kinh Xang), was an established US Navy and VNN river patrol base, and until a year before had held the US 9th Infantry Division. There were still army units housed at the rear of the naval base, where the EMUs were to be quartered. Toilet and kitchen facilities were disappointingly poor, while the limited water supply allowed no provision for showers. To remedy these deficiencies, ‘Operation Outhouse’ under the supervision of the company construction officer, Lieutenant W. M. Kimpton, brought to Dong Tam the plumbing and porcelain ware of the shower and toilet block built at Bearcat. This was supplemented by a further two ten-ton truckloads of plumbing ware and building materials ‘acquired’ with typical Australian ingenuity by Sub-Lieutenant Perry. Additional ovens for the 135th’s kitchen were also brought from Bearcat. Further difficulties arose due to the poor communications facilities at the new base. There were no telephones to link the company living quarters with the operations room a mile away.